There’s a definite lack of seriousness in Phoenix. 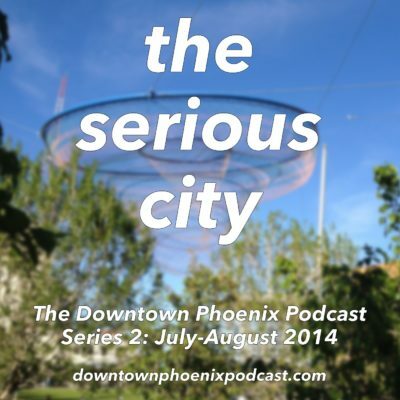 How can Phoenix become The Serious City? There is a definite crisis of seriousness in this city. While other urban environments across the country and in our metropolitan area score dense transit-oriented development, the best we can muster in Phoenix is four-story suburban residential complexes. While downtown Tempe gets major operations centers for U.S.A. Basketball and State Farm Insurance, a Phoenix councilman touts two new fast food restaurants opening near a shopping mall as investment. We’re not taking ourselves seriously and expecting great things of ourselves, our civic leaders, and our elected officials. We know that the global economy is becoming more and more focused on cities and urban agglomerations instead of countries or states. Cities are competing against other cities for economic development: it’s Phoenix vs. Seattle or Fortaleza, not Arizona vs. Washington or Brazil. Unfortunately, Arizona’s cities get the short end of the stick when it comes to who defines whom: it’s always Phoenix that gets branded by the crazy political environment of either the State of Arizona or Maricopa County. One last thing: In his first monologue returning to television after the 9/11 attacks on 17 September 2001, David Letterman, urging his audience to face the coming uncertain days with courage, said that “pretending to be courageous is just as good as the real thing.” As a 13-year-old kid confused and wondering what was happening and what was going to happen next, Mr. Letterman’s words resonated — and still resonate — with me. The same philosophy applies to what I’m trying to get at here: If we want Phoenix to be an important city, we need to pretend and act that it already is. The rest should follow. More on this later — especially as part of Series 2 of The Downtown Phoenix Podcast.